B. Thomas (Arlington, Texas, United States) on 24 January 2018 in Landscape & Rural. * About 3 years ago Hubby/Sherpa/Guide and I went on a trip to Yosemite National Park. We also went to Monterey and San Francisco, and then other trips soon after. I had so many photos that I only posted a few from Yosemite at the time, and had planned to get back to them. So, here are the forgotten photos. Mountains show the pictures remind us of what size a person is in this world. A beautiful view of this famous climbing location. I think 20 years ago we were there too !! Beautiful photo - well worth waiting for. Wonderful capture of the landscape ! What an inspirational moment to have stored away . . it must feel as fresh, now, as the moment you took it. Great scene. The mountains are majestic, aren't they? What a magnificent sky !!!!! A wonderful view of the mountains. Yosemite is very impressive. This will be a great series. @Jeff & Pat: Sure. We can't have you jumping on your camera. ;-) Thanks! A spectacular image. Love it. Looking forward to your 'forgotten' images! Oooooh!! 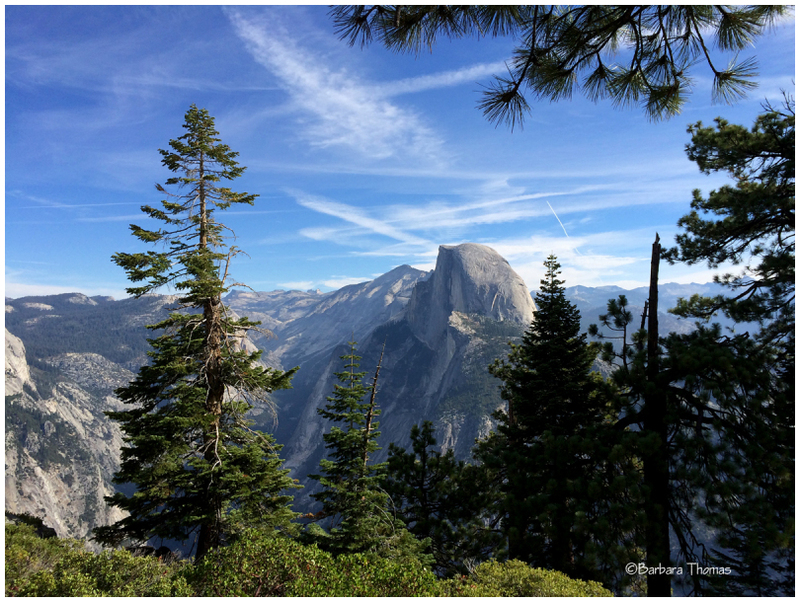 A gorgeous view of Half Dome that you framed perfectly with the evergreens!! I do the same when it comes to photos from the past. I just don't want to bore viewers, so I stop after a while. But it's good to go back as you are doing now. A beauty of Half Dome. Well done! One of the best views one can ever see. Beautiful! Love Jeff and Pat's comment. Snort, snicker. This is lovely catch.